Tag-Archive for "Appleton Estate V/X Jamaica Rum"
With so many rums on the market, picking one for my first full rum review was never going to be an easy choice. However that choice became a lot easier, thanks largely to the generous support provided by the lovely people at J Wray & Nephew, the parent distillery of Appleton Estate Rum. With a history dating at least as far back as 1749, Jamaica’s Appleton Estate is known for its hand crafted blended rums and their unique taste and quality. 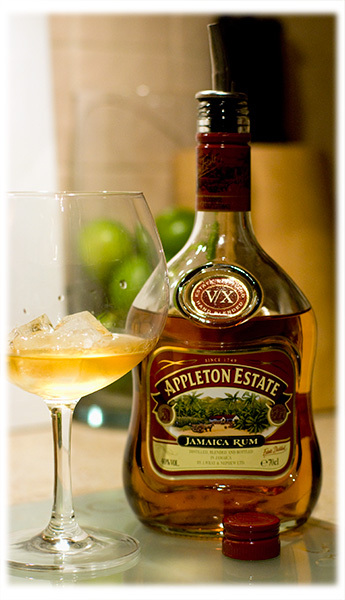 The flagship rum of their range, the Appleton Estate V/X Jamaica Rum is a blend of fifteen rums of varying types and ages. Golden in colour, with a rich orangey aroma and a smooth, rich and sweet taste, this rum makes for a great premium mixing rum, while still retaining enough character and complexity for sipping over ice. Presented in the distinctively shaped Appleton Estate 70cl bottle, with its depictions of a traditional sugar plantation and the rum distillery, Appleton Estate V/X Jamaica Rum has been bottled at 40% ABV / 80 Proof. The tastings and cocktail making were done over several evenings, allowing an opportunity to properly assess the qualities of the rum. Tastings included sampling the rum neat and over ice, as well as the base rum in the following cocktails: Cuba Libre, Daiquiri, Mai Tai and Mojito. 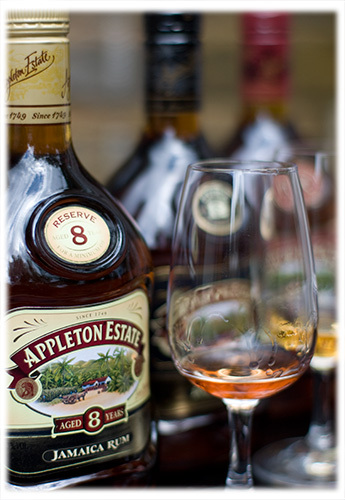 Neat – In its most basic form, the Appleton Estate V/X Jamaica Rum has a smooth start with a slightly spicy after-bite. Notes of honey and burned sugar come through in the mouth, while the aroma has a noticeable orange peel scent. Over Ice – Adding ice to this rum really lets it open up and gives it a silky smooth finish. Given a choice between drinking this rum neat or over ice, over ice would always be my preferred choice. Cuba Libre – Despite the strong flavour of the lime, the complex flavours of this rum really shine through, giving this cocktail a more noticeable and robust taste. Daiquiri – Again the stronger flavour of the V/X rum stands out in this classic cocktail. While not quite as refreshing as when made with a good white mixing rum, this Daiquiri had plenty of taste and made for an excellent cocktail. If trying this one yourself, you may want to add a touch more sugar to compensate for the more complex flavours of the rum. Mai Tai – With this cocktail calling for both a golden and a dark rum, I feared that the flavours of the V/X might be lost among the stronger flavours of the Myers’s dark rum. This fear was proved unfounded as, despite being more subtle than in some of the other coctails here, the character of the V/X came through and helped this drink come alive. Definately a good combination of rums in this great drink. Mojito – Like the Daiquiri, this is another cocktail that is known for its refreshingly light taste and is most often made with a white mixing rum. Adding a golden rum was clearly going to change the taste profile of this cocktail, giving it more character and flavour. And with the quality and complexity of the V/X, this change was certainly a positive one. Although it still made for an excellent Mojito with white sugar, you may want to experiment making this with some form of brown sugar, thereby complimenting the rum with the more complex sugar taste. 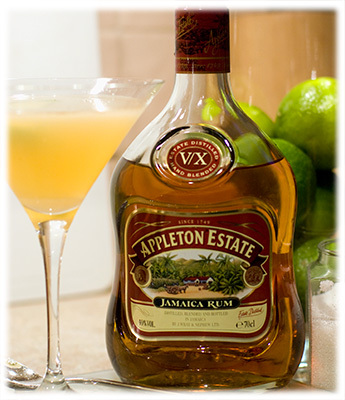 In summary Appleton Estate V/X Jamaica Rum makes for an excellent mixer, deserving of its premium label. It brings a smooth and complex taste to all of the classic cocktails (Cuba Libre, Daiquiri, Mai Tai and Mojito) without being too overbearing or distractive from the expected taste. 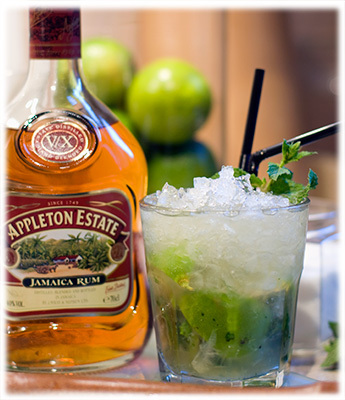 It is also easy enough to sip and enjoy it over ice making this rum a great all rounder.